Smile Catherine, it could be worse. Demotix/Vedat Xhymshiti. All rights reserved. Experts and analysts have given up complaining about the non-existent European foreign policy. Even the lack of consensus in such a relevant issue as the vote for the Palestinian state recognition at the UN seems to have raised less criticism this time than in September 2011 - when the bid was initially rejected. The last three years have seen a wave of Ashton-bashing, who seemed to embody all the disappointments and frustrations about the shrinking role of the EU in the international arena, and about the unfulfilled expectations to become a real global player. Not any more; a least, not with the same virulence. Despite all the nostalgia about what Javier Solana had done without even having the mandate; despite all the speculation about what the flamboyant title of High Representative of the Union for Foreign Affairs and Security Policy given by the Treaty of Lisbon might have truly meant, there is a common assumption that nothing will really move ahead until the general economic, euro, and institutional crisis is resolved. The list of frustrations is long, though, and each of its items has only deepened the sense of irrelevance among Europeans. Back to the past, probably the case that best symbolizes the problems of the EU foreign policy was the Climate Summit at Copenhagen in December 2009. The champion of global environmental policies, the undisputed leader in the fight for sustainability, the EU, was left out of the final agreement. The US president, Barack Obama, and the Chinese prime minister, Wen Jiabao, had arranged the text when the other BRICS – Brasil, India and Russia – sneaked in the room; but the Union was not even invited to join in. Catherine Asthon and Herman Van Rompuy had been named just a few days before, so the Summit’s outcome had little to do with their negotiation abilities or their leadership skills. From Copenhagen to Doha last week, not much really substantial has been achieved in the battle against climate change and the European 2020 Strategy - the world’s most advanced set of policies in this realm – is barely used as a model by anyone else. From then on, division has been the key feature of a weird construction once meant to be the Common Foreign Policy. The impossibility to reach a joint position towards the Palestinian bid at the UN; the discrepancies about the NATO-led intervention in Lybia– with Germany in its favorite role of reluctant power ; or more recently, the abrupt failure to create the largest European aerospace and defense group, through the merger of EADS and BAE Systems are just a few examples of fragmentation among member states when dealing with the rest of the world. It was a pity, in fact, that the construction of the new European diplomatic agency, the European External Action Service (EEAS) coincided in time with one of the most exciting chain of events of the last decade: the Arab Spring. The sudden transformation of the southern neighborhood was the perfect opportunity for Europe to accompany change in such a strategic region; but in spite of all the rhetoric, the overall answer has been timid, fragmented and late. Today, Syria is the stage of a terrible civil war to which an almost undaunted international community, including the EU, has been unable to respond properly. The EEAS itself has had its own problems. 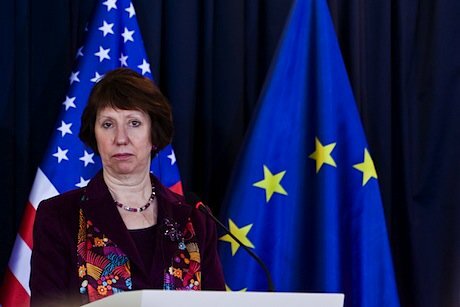 Not that anyone had ever thought that setting up a brand new EU body would be easy, but the bureaucratic and technical issues and, once again, the struggle to place key national names in key positions took over much of the initial process, to which Lady Ashton has devoted much time and effort. This personal investment was not enough to prevent a foreseen reduction of around five percent for the EEAS's budget from 2014 on. It would be unfair, in any case, to blame a single body ,or a single person, for the perceived paralysis of European foreign policy. Amidst the general uncertainty about the EU’s goals and means fostered by the crisis, the Nobel Peace Prize has come as a reminder of what the Union stands for: the best example in history of successful integration in search of peace. Given the current circumstances, it is hard to believe that the Prize might spur indulgence among the member states but it remains to be seen if it can work as an incentive to take the next decisive move towards more Europe. The challenges for a real European foreign policy remain many. To start with, the new quest for sovereignty that the economic crisis has relaunched. When things started to go wrong, solidarity, the value which the EU project had been built upon, was replaced by national interest. If the gap between North and South, between rich and poor within the Union keeps growing it will be harder and harder to find common ground for a coordinated action. Unfortunately, it is not among the citizens’ worries or priorities: according to the Spring 2012 Eurobarometer, only seven percent of Europeans include foreign policy among the most important issues facing the EU, while 54 percent mentioned the economic situation, 34 percent the state of Member States public finances and 32 percent unemployment. The evident lack of political will lies beneath many of the current woes. Even if many relevant decisions have been taken in the last months in order to strengthen the economic and monetary union, the general feeling both inside and outside the Union is that there is a constant reluctance to take decisive action. Today the EU is in a slightly better shape than one year ago, when the whole project seemed about to collapse at any instant. But the European leaders have only bought time, without really daring to tackle the root of the problems. The sudden instability caused by the gloomy political landscape in Italy shows the fragile foundations of this tense calm in which we have been living. Another major challenge is the UK. Despite its isolationist tendencies and self-exclusion from decisions such as the Fiscal Compact, the possibility of a British withdrawal of the Union opens a completely different scenario for the EU. A European foreign policy without Britain would be seriously handicapped. The challenges remain many but so do the opportunities. Having to choose between dissolution and further integration, the vast majority of leaders clearly prefer the latter; and so would European citizens if confronted with a choice to leave or to stay, as the Greek case has show - even if the image of the EU keeps deteriorating. Not only that: more and more voices are in favor of moving towards a political union, starting with the president of the Commission, José Manuel Barroso. And the growing gap between citizenship and politics all across Europe calls for enhancing democratic practices. In September, the Future of Europe report, signed by eleven foreign affairs ministers - from Sweden, Spain, Italy, France, Germany, Poland, Austria, Belgium, Denmark, Luxembourg and the Netherlands - was an attempt to bring foreign policy upper in the agenda. Interestingly enough, the lead in this field is being taken by countries and personalities who had not been at the core before, such as Sweden and Poland, and their respective foreign affairs ministers, Carld Bildt and Radek Sikorski. The latter’s speech in Berlin last year is still considered the best manifesto of a European foreign policy-to-be. Additionally, the need to draw a real strategy has spread among scholars, think tanks, and officials; even if the light at the end of the tunnel is still very week, some people are starting to prepare what the EU might look like after the crisis. The European way and experience of building consensus and using its soft power is also a chance in this new multipolar world. Throughout its history, Europe has shown a great degree of resilience to adapt itself to change, while guaranteeing peace and prosperity. No doubt that Europe could make it work again, but as events in Greece, Italy, the UK or Spain show, time is running out.